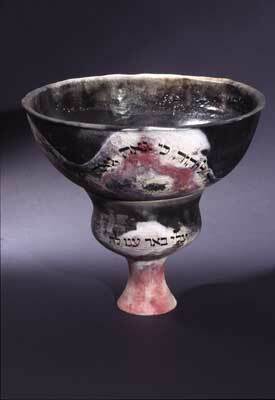 This cup is similar to the one purchased by the National Museum of American Jewish History. The lower cup represents the well that Miriam was able to locate in her travels through the desert. After she died, people could no longer find the well. It represents women's powers that have been present through the ages but have gone unrecognized and unused. The top section, that has a portion from Song of the Sea in Hebrew, can be used for new rituals.